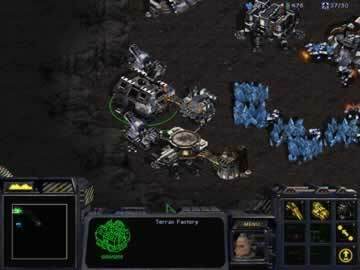 Starcraft Game - Download and Play Free Version! Rouse the men from their barracks, load the guns, and get the Vulture running. War has just broken out in the galaxy and it needs you to safeguard it! 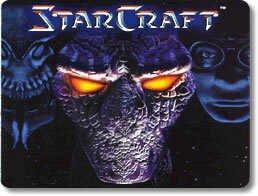 Welcome to the universe of StarCraft, one of the biggest and most influential games to ever hit the industry. Immerse yourself into an extensive space opera setting rife with corruption, intrigue and evil from beyond the darkness of space. You’ll scour the landscape of assorted alien worlds, harvest precious resources from the land, and use them construct buildings, produce devastating weapons of mass destruction, and train hardy soldiers of war. With your vast amount of assets at hand, you can then do battle against legions of mechanized siege engines and swarms of fearsome aliens. If that’s not enough, you can then join the extensive online community that has been over ten years in the making and test your tactical wits against other players in fast-paced multiplayer combat. 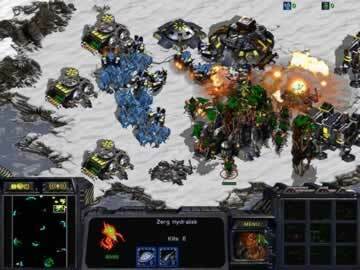 StarCraft has it all, and that is why it regarded as the undisputed king of the real-time strategy genre. Protoss and Terrans and Zerg, Oh My! The year is 2449. In the Koprulo Sector of the galaxy, trouble is beginning to stir among the human colonists known the Terrans. Not only has society gone under the oppressive heel of the Confederacy of Man, but things have just become a lot more complicated. As a rebellion is waged across the Confederacy, an alien race calling itself the Protoss suddenly makes first contact in the form of one destroyed colony. As the Terrans attempt to recover from the incident, one Jim Raynor discovers that a second alien race has been infesting various colonies under everyone’s nose. Called the Zerg, it may just be the biggest threat the Koprulo Sector will ever face. Experience a three-act story from the perspectives of all three races: Terrans, Protoss and Zerg. Complete 30 missions of escalating difficulty to see this tale to its end. Harvest two kinds of resources from the environment: Vespene gas and minerals. Set up buildings and production facilities. Use them to train soldiers, manufacture specialized vehicles, and upgrade units as necessary. Descended from human criminals and other undesirables from Earth, the Terrans were sent to colonize the far-off Koprulo Sector before attaining independence. Suiting up in massive suits of power armor and wielding a variety of devastating firearms, their favored tactics should be familiar to anyone knowledgeable about warfare. They are capable of producing both strong and economical units, and hence offer a balanced and flexible approach. Set up your buildings anywhere at anytime with no restrictions. You’re only limited by how many resources you have. Train powerful soldiers, including Marines for terrestrial combat or stealthy Ghosts for scouting and assassination. Produce useful vehicles like the fast-moving Vulture, the slow but powerful Siege Tank, or the anti-psionic Science Vessel. If the Terran and the Protoss forces feel too orderly for you, then you can always try out the Zerg swarm. Consisting of a race of bestial and insect-like aliens commanded by an Overmind, their strength lies in the fact that they can breed fast and amass greater numbers than the other two races. Corrupt the land under a massive expanse of organic tissue called the Creep. You may only set up Zerg “buildings” upon this blight. Breed swarms of Zerglings, the cheapest units in the game and the quickest to make. Use your Queen for a variety of tasks. Attach a parasite to enemy units to see everything they see, produce Broodlings by infesting organic foes, or slow down enemy movements. As an intelligent race of humanoid aliens, the Protoss have the most technology by far and possess the greatest minds in the universe. Thanks to their immense physical strength and impressive psionic powers, they are capable of creating the most powerful units in StarCraft. However, power comes at a price and must be paid for in exorbitant amounts of minerals and Vespene gas. Use your Protoss men well, because losing just one will be a costly affair. The Protoss have the quickest and most efficient construction process. Lay down a probe to summon a pre-constructed building at its location. Buildings require Pylons to be constructed and powered. Defend the Pylons to keep your bases up and running. Every unit has a protective shield. Upgrade them with a Shield Battery to make it recharge faster. Train mighty warriors like the psionic sword-wielding Zealots, the storm-summoning High Templar, or the stealthy Dark Templar. If the computer is failing to be a worthy opponent for you, then you can always challenge other players. Go onto Blizzard’s proprietary Battle.net service to take the galactic war online in a variety of arenas. Don’t let StarCraft’s age fool you; its online community is just as healthy as it was back in 1998. Play with or against up to seven other players. Battle it out on over 50 official maps. lay individual or team-based games of deathmatch, capture the flag, king of the hill, and more. Play Ladder matches to get onto the online leader board and see where you rank among the rest of the player base. No strategy gamer’s library is complete without the original StarCraft. It revolutionized the genre with its use of asymmetrically-balanced units and brought everyone an awesome science fiction story and universe to boot. The singleplayer game will keep you occupied for a while and the multiplayer can keep your attention for years. It has for millions of players and it will continue to do so for many more.